Rhabdomyosarcoma (RMS) is the most common orbital malignancy in childhood. Embryonal RMS and alveolar RMS are the two most common histologic subtypes of RMS, and embryonal RMS is the most common subtype of orbital RMS. 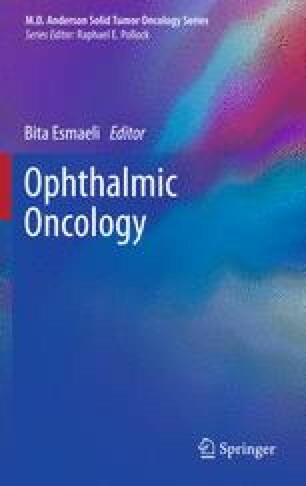 The clinical presentation of orbital RMS depends on the tumor location in the orbit. Diagnosis is chiefly made through open biopsy, and complete initial tumor resection is uncommon because of the risk of ocular morbidity. The treatment of orbital RMS requires a coordinated effort by the disciplines of ophthalmology, pathology, pediatric oncology, and radiation oncology. Because of advances in the planning and administration of chemotherapy and radiation therapy, the outcome for patients with orbital RMS has improved; the 3-year failure-free survival rate is greater than 90%, and the 3-year overall survival rate is 100%. Continued improvements in therapy are being investigated in an effort to decrease the risk of treatment-related late effects, such as cataracts and facial asymmetry.